Note : Please note, the 3:30pm show on the 24th of November is a discounted students only show. Please carry valid college ID cards for entry. In a town which is engrossed in annual Navratra festivities, a beguiling event turns everyone’s world upside-down. Close loved ones and acquaintances, it becomes apparent, are transforming into buffaloes, eventually recognised as Mahish, a phenomenon which everyone can identify but no one is able to comprehend. The play is a reimagination of Eugene Ionesco's infamous Rhinoceros, grounded in the befuddling political play of present Indian society. Anannya Tripathyi, Anomita Sen, Dhwani Vij, Jayant Chand, Lakshvir Singh Saran, Mohammad Faheem, Niketan Sharma, Rahul Tewari and Sarthak Dewan. 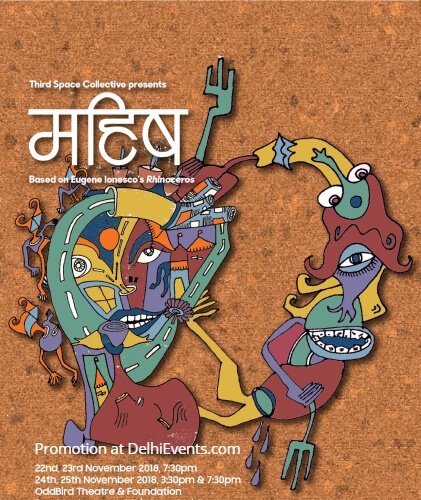 Costume: Anannya Tripathyi and Anomita Sen.
Third Space Collective (TSC) is a group of theatre practitioners in Delhi creating theatre which is of relevance to the times that we live in. We are involved in facilitating workshops, curating performance laboratories, and of course, creating performances. The Collective finances its work by generating funds through performance fees, workshops and grants from cultural institutions.